“(T)he Strip remains in ruins, light years away from the reconstruction many had hoped for. Unemployment exceeds 40% – for youths around 60%. “(N)o significant rebuilding is taking place and civilian infrastructure has not even been restored to its state prior to the operation. Poverty and aid dependence are rampant.” Widespread destruction was overwhelming. 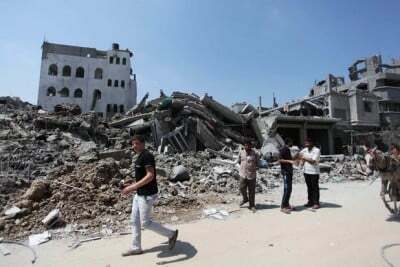 File photo of Palestinian homes and buildings destroyed by Israeli airstrikes. From last August’s ceasefire to end of July this year, “Israel allowed (sparse amounts) of construction materials into Gaza via Kerem Shalom Crossing,” said Gisha. Only about 22% of them were intended for the repair of homes that were damaged during the fighting. The rest were intended for international aid agency projects. 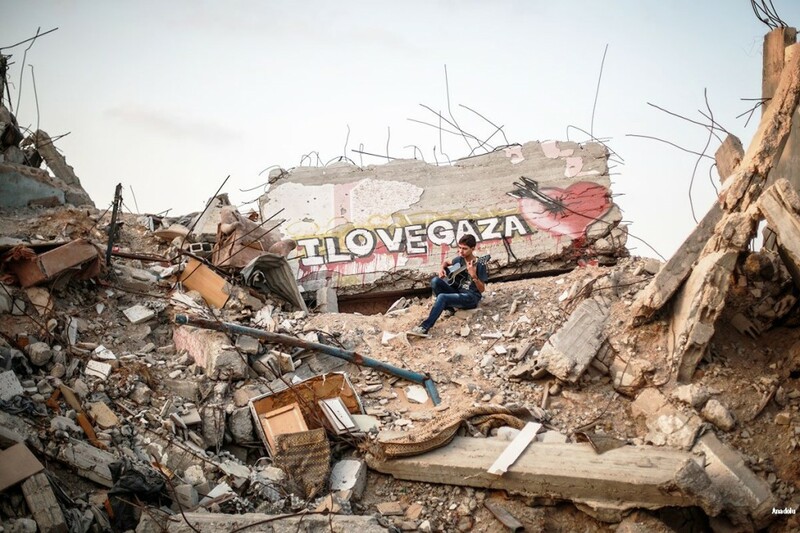 Destruction last summer was so extensive, Gaza needs an astonishing “22 million tons of construction materials” for destroyed or damaged houses, infrastructure, public and private buildings. If unimpeded reconstruction began today, it would take a generation or longer to replace what was lost – assuming the unlikely possibility of no more Israeli wars. On the one hand, its officials want Gaza kept isolated, largely in ruins. On the other, they have sole authority on what companies may participate in the limited reconstruction permitted – monitored by Israeli cleared guards and round-the-clock security camera surveillance. A contractor whose building project in Gaza was approved by Israel told Gisha that he had to provide Israel with the location of the building, the building owner’s ID card, the building plans and the amount of construction materials required. The contractor said it took four months for the project to be approved, and he decided to invest elsewhere in the meantime. As a businessman, I wouldn’t want to build now. To build I’d need to hire people and sign contracts with workers and with other companies. It’s not worth my while because I can’t be sure my project is going to get approved, and until it does, I lose money because I have to pay the workers I signed on. If the project does get approved and then there’s a cement shortage, I also lose. So then the question is if the construction materials approved for the project enter quickly or not, whether they come in all at once or in batches, which would force us to wait a long time at every stage of the construction. Cement has to be available on the market for the private sector to start building and working, and for the people who have the money and are not waiting for donations, to be able to build – not just the people whose homes were destroyed, but anyone who wants to build additions to their house, add another story, or build a home to get married. The UN/PA/Israeli established Gaza Reconstruction Mechanism (GRM) is so complex and hard to navigate, it’s “more hurdle than help,” said Gisha. The only rebuilders able to deal with Israeli bureaucracy are international agencies and Qatar – and not easily. Other near-impossible hurdles to overcome include a severe lack of funding. October 2014 Cairo donor country pledges never materialized. Impoverished Gazans can’t afford material and other costs to rebuild on their own. Outside help is essential. Progress proceeds at a snail’s pace. Israel bans materials it claims have “duel use” – allegedly for military purposes or (legitimate) tunnel construction – to provide Gazans with essential goods not available otherwise or in short supply. GRM obstructionism “prove(d), once again, to what extent Israel exercises control of civilian life in Gaza, while largely disavowing responsibility – this combination harming a beleaguered population,” Gisha explained. “(I)t’s time to put the GRM to rest.” It slows things down, increases costs, and obstructs rebuilding. A year after summer 2014 Israeli aggression, reconstruction restrictions have to be entirely removed, Gisha stressed. Israel turned large parts of Gaza to rubble, massacred or injured thousands, contributes nothing to rebuild vast devastation it caused, and obstructs legitimate efforts of others. What better definition of a racist rogue regime – a genocidal one with more wars in mind.